US Road Trip Days 5-6 – Vintage cars and Barefoot Friars | Where's my backpack? Despite being desperately tired from our previous day’s drive, we rose early to the sound of a rooster crowing and the enticing aroma of coffee. My friend’s mother had prepared a sumptuous breakfast which we ate leisurely outdoors in the cool of the morning and the shade of an apple tree. I learned that it had been hot and dry here all summer, and that this part of Wisconsin was in the throes of a very serious drought. Our next two days on the farm were spent ambling through the surrounding countryside, which bore evidence of the desolate effect a drought can have. We wandered through fields of stunted and failing crops, and found vast swathes of cracked mud where once were ponds. Disconsolate frogs and dragonflies gathered around the small patches of wet mud that survived, and snail shells by the hundreds were the only traces of the vibrant ecosystems that had been decimated by the arid conditions. 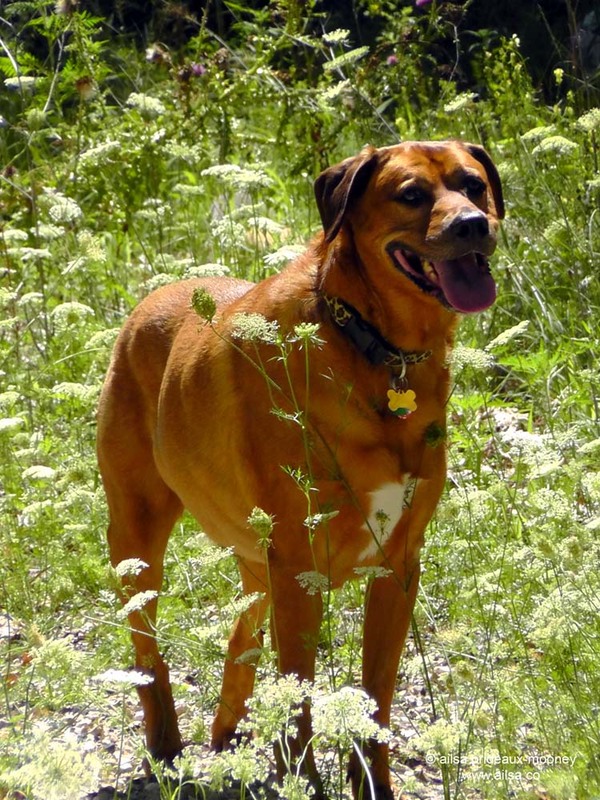 Sprocket cast off his city ways and embraced life on the farm. He proved adept at finding the few muddy patches that remained, emerging proudly from his latest find caked in thick dark wet earth with a satisfied gleam in his eye. In cleaner moments, he frolicked with his farm dog cousin Paddy in flower-strewn meadows and happily posed for the occasional photo. For all of Sprocket’s country gamboling, however, there remained a fascinating gulf between him and Paddy. Paddy was a farm dog through and through and I swear if he were human, he would wear dungarees and chew tobacco. Next to him, even when caked in mud, Sprocket had an air of refinement and, I fancy, of erudition. You could have a conversation with Sprocket and feel like you were both getting something out of it. Paddy just wanted me to throw a ball. So I did exactly that and we were both happy. Further afield we found forest and all manner of woodland creatures peering out through chinks in the thick of the trees. Most were too quick for my lens, although I did manage to capture a quick photo of one cheeky little onlooker who believed himself hidden from sight. I didn’t want to shatter his illusions but Paddy caught his scent and gave the game away. We bid a hasty retreat to let the little fellow forget our intrusion and resume his bucolic existence. My friend decided to show me around, so we took a drive and I was surprised to discover we had landed in the little township of Erin, with street names such as Donegal Road and O’Connell Street bearing witness to the Irish immigrants who had settled here. There was a long, winding lane rumoured to be haunted by a beast that chased cars off the road in the dead of night. We drove it in the daylight and thankfully had no such encounter, although my friend swore she had narrowly escaped the wrath of the beast several years before. High up on a tree-covered hill, the spires of a church beckoned parishioners to their devotions. Aptly named Holy Hill, it is home to an order of Carmelites, or more specifically, Discalced or Barefoot Carmelites, so called because they wear sandals which were traditionally the footwear of the poor. We spied quite a few sandal-shod friars as we explored the grounds and climbed the tower to take in the view. The church interior was intriguing; almost all of it paying homage to Mary, with only one small alcove off to the side reserved for a statue of Jesus. 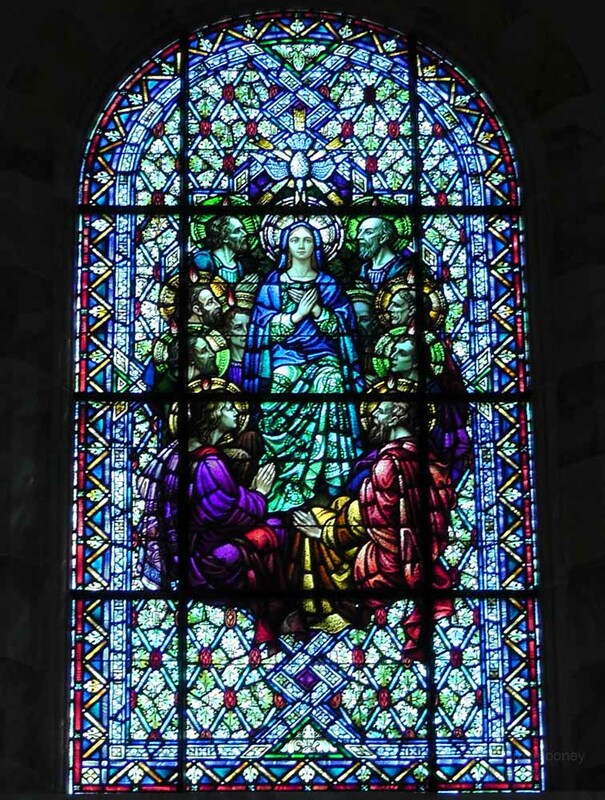 I picked up a leaflet which told of a group of European hermits who settled on Mount Carmel in Israel in the thirteenth century and built a chapel dedicated to Mary. I don’t know enough about the Carmelite order to understand the significance of their choice to dedicate to Mary, but I admire the nod to girl power. 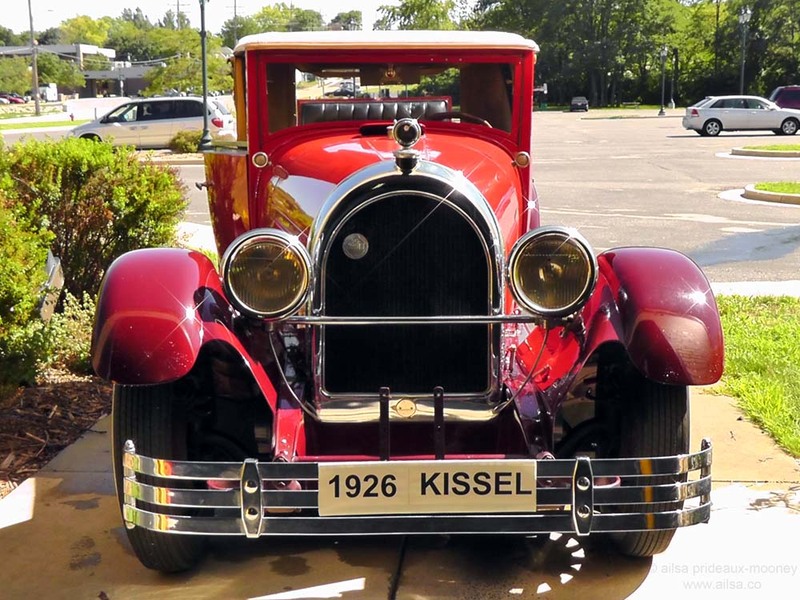 On the way back to the farm, we stopped by Wisconsin’s Automotive Museum and happened upon a chap who was readying one of Wisconsin’s vintage cars, the Kissel, for a vintage car rally. It was quite a treat to get up close and personal with such a rare beauty – there are only 150 ‘Kissel Kars’ known to exist today. Back at the farm, my friend managed to catch up with her school pals who eagerly filled her in on all the gossip from the reunion she had so narrowly missed. Meanwhile, her dad busied himself by repacking the car, miraculously managing to fit all of our belongings plus Sprocket’s crate inside the back of the car, rearranging things so that I could sit up front. I bravely hid my disappointment at leaving my spot in the back seat. It was the best feeling in the world to have Sprocket sprawled out with his head snuggled into me, but he would need to get used to being in the back seat alone at some point if my friend ever needed to drive somewhere alone with him. Tomorrow we would brave the roads around Chicago and make our way further east. For now, we settled in to enjoy our last few hours of life on the farm. This entry was posted in Photography, Travel, United States, wisconsin and tagged history, humor, nature, photography, photos, travel, writing. Bookmark the permalink. Ailsa the amazing storyteller. The photos are good illustrations, but the story would be good even without them. I should have mentioned my favourite photos: the animal in the tree trunk, and Sprocket in the flowery field. I am always looking forward to see where you go to next and what you are up to. Seems like you are having tons of fun. Glad we can experience it with you through your blog. 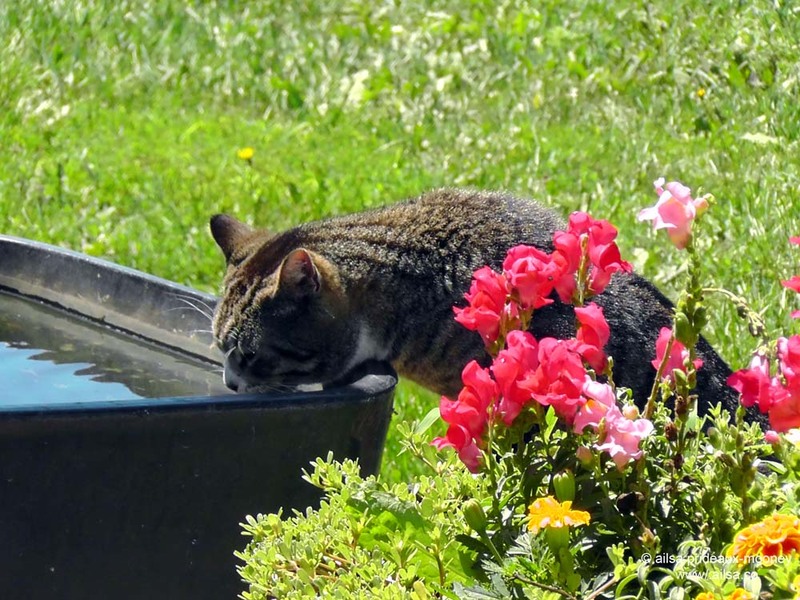 I love the little details of the countryside, and your photos in this post. I can really imagine being there. Yes, Kathy, it’s been such an incredible journey. It’s sad to see the effect the drought had on the surrounding countryside, and the farms were suffering too. Caught up at last! Am so enjoying your road trip Ailsa, and your great photos remind me of my own cross-continental drives, way back when! I’ve had a blessed life, Ailsa, I admit it with lots of wonderful wanderings, many of them by road, which is really the most wonderful way to travel because you can stop wherever you want, whenever you want – to nose around, and that’s what i love to do. I’m glad you enjoyed it. Does your dog always accompany you when you travel? Great story. You really know how to tell a story! nicely captured! It’s like I visited the place with you. Liked it a lot. What an interesting travelogue. Your photographs are fabulous (I’m a sucker for nature and animals) and I enjoyed reading about the city dog and farm dog. Thanks, A Table in the Sun, and I love that you call it a travelogue because that’s what I call it too, with a nod to the great travelogues of old. I’m very glad you enjoyed it, and yes, Sprocket and Paddy were endlessly amusing. Dogs usually are! I love how you give details to your photos and your travels. They keep me interested and entertained. I am learning a lot from your post. And love that picture of the oldtimer! Haha, excellent, Lori, Girl Power indeed! 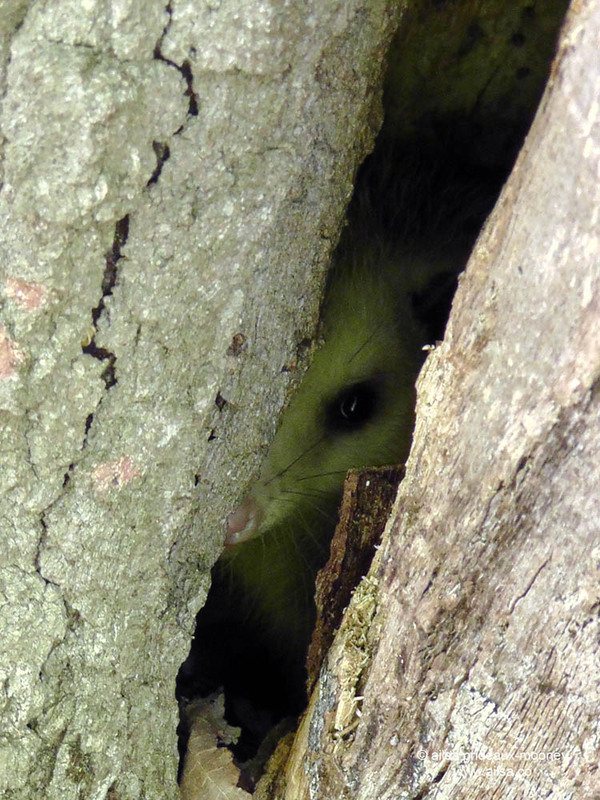 Dear little thing peeping through the crack in the tree…..I’m loving your tales, enjoying your travels. Next chapter please! Lovely writing, beautiful photos. Congrats on spotting the secret tree beast! Haha, love it, I shall forever more refer to him as the secret tree beast! What a lovely excursion–from disconsolate frogs, to Paddy with the sheeny coat, to a bashful, Ariel-like tree dweller… magnificent. so really enjoying your travelogue each week. Thanks. Thanks you for this blog. “Charlie”: and I loved wandering with you. Always thought I’d love to live on a farm. Still do. Super post. Lucky you :-). Just catching up on your travels …after following much of the same route. Spent a couple great days exploring Yellowstone last week, then drove from Billings across ND (part of the way in a full-blown blizzard! ), then spent three days at the Lake in northern MN about an hour north of Brainerd with all the brothers. As usual, your amazing photos and spirited writing are a joy! Thanks. Back in the saddle in Times Square for a few weeks, then off to San Diego and Phoenix for a week … Maybe a day or two south of the border! The photo of the mouse is incredible? Your trip sounds great. Enjoy reading your delightful travel story. 🙂 Great shots. 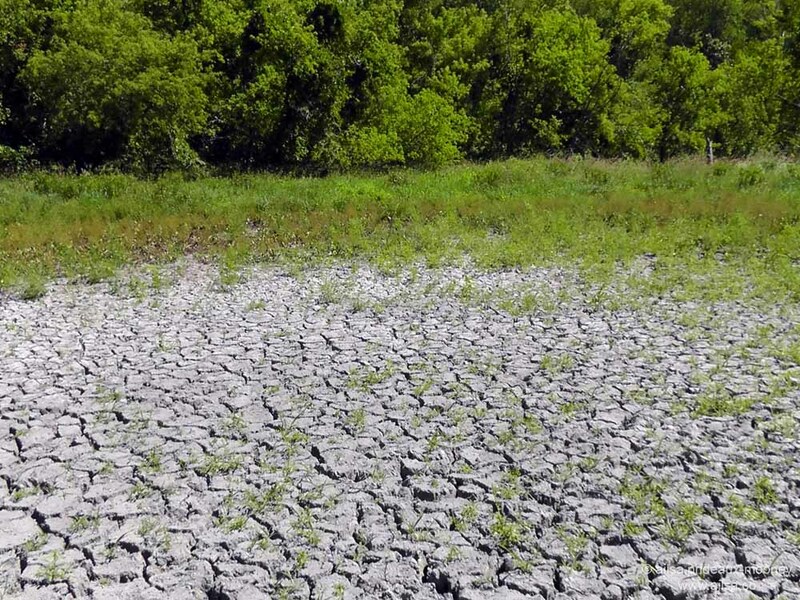 The photo of the drought in that part of Wisconsin look sad. Your travel writing is second to none! I’ll confess I just read your tale so far… backwards. (It’s episodic, so it doesn’t SEEM like it loses much, but forgive me!) It’s lovely either way. You’ve got some great photos and a great adventure to tell. Thank you for sharing this! Another great instalment of your travels, I love the pictures especially the creature peeking out at you!